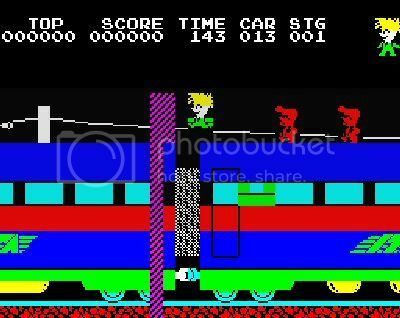 by PaulEMoz in "Hudson Soft", "Stop the Express", "ZX Spectrum"
I'm sure one of my mates owned this way back, but I can't remember actually playing it. Stop the Express featured in various Top 100 lists when I was looking for blog ideas and it jogged a memory, so here we go. And bloody hell, it was nearly "there it went". 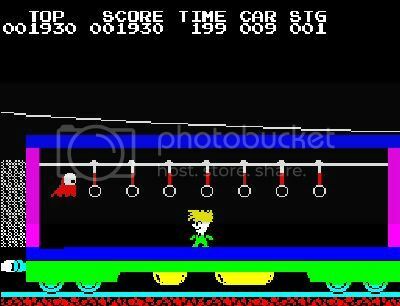 This game, at least when you first start playing it, is rock.It doesn't look like it would be... the basic aim is to run across the rooftop of an express train, jumping across the gaps, to get to the front of the train and, umm, stop it. What's difficult about that? Now, you just know that this one is going to hurt. Plenty, when you don't know all the rules and all the controls. Obviously, the game throws obstacles at you. It wouldn't be much fun if you just ran, unimpeded, to the front of the train. No, the point is that the train has been sabotaged, and the bad guys are out to stop you from stopping them. They'll climb up onto the roof of the train and give chase, pausing only to shoot at you. Yes, they're armed. Pretty Polly pushes off the perps. It was at this point the frustration overtook me, as I died time and time again. I really was getting sick of seeing "Game Over" pop up, with me having a final score of 0. It couldn't possibly be that hard. And then I saw the bird flying overhead and wondered what would happen if I jumped at it? Turns out you collect it, and can then unleash it on your attackers, knocking them from the train. And it's at this point that Stop the Express turns from a frustrating waste of time into a fun little arcade game. Over to the Commonwealth Games, and up next for England, on the rings, it's Malcolm McLaren. For an early Spectrum game, I have to say it looks pretty good. There's a lot of colour in the game with barely any clash, other than the characters having a black block around them. It doesn't hurt the game in any way. Your mad-looking little Malcolm McLaren-esque fella is really quite endearing. I was also surprised to see the traditional arcade font... I was so used to seeing the classic Spectrum font in games that I presumed it was very difficult to program anything else. It certainly adds a fair bit to that important arcade feel. 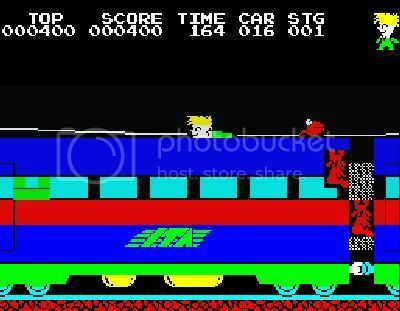 Once you get the hang of it, Stop the Express is an enjoyable little arcade romp, blessed with a fair helping of that "just one more go" quality. I was a little surprised at just how much I did enjoy it... eventually. If you feel like giving it a go yourself, just make sure you read all the instructions first!